Our web is not a book. Internet is over stuffing with data. If you type a query in search box, traditional approach like “<< Prev 1 2 3…10 Next >>”, will appear & you will see the answers to your post which are optimized. If you are using infinite scrolling then this technique continuously loads more content as the user scrolls down the web page or select an action button such as load more, scroll down etc. Best example of infinite scrolling is used on Facebook, when you see news feeds of your friend’s network, while scrolling you goes down-more down to see updates of your friends. Social networks are heavily using this feature because they can continuously show ads in a column; there is no footer so infinite space is available for advertising, no need to wait for refresh of page or other user click. It is beneficial to listen what your users are saying and trying to do like that. How to decide to continue with Pagination or to adopt infinite scrolling? Context, the purpose of your presence on web, plays vital role in deciding the technique. Google uses infinite scrolling in “Image Search”, while it uses traditional Pagination for text search queries. You can use your logic in business way, means progressive enhancement is applicable here. You can use combination of infinite scrolling & traditional pagination in different web pages of your website or blog. In traditional pagination if you go in wrong page then by using back button you can find your right track but in endless scrolling you have to roll back to your previous point which was outdated from mind. Infinite scrolling fails in mainstream websites, in future it may be useful in some part of this e-commerce or shopping websites. With pagination, users can group a page’s results together or use filters to mine data, so it is hard to adopt infinite scrolling. Business context & good implementation of infinite scrolling will only give you amazing search experience. Google does it. You know 1. Users want more results per page, 2. Users want faster results. The infinite scrolling only satisfies both needs. On mobile devices, tablets or in the world of touch devices where responsive designing is used, infinite scrolling does magic. 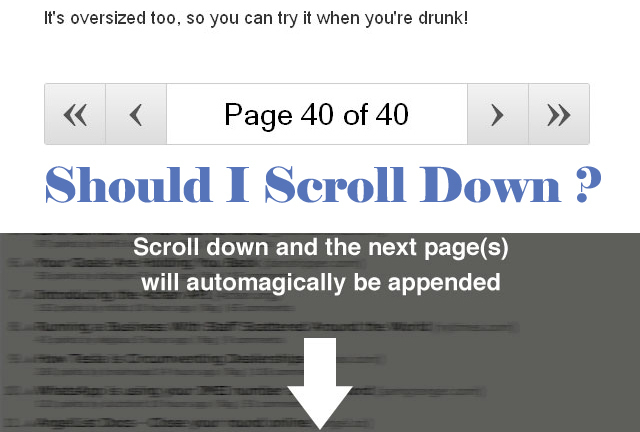 Infinite scrolling allows increasing average page view time as well as increases usability. You can retain your visitors on a page without doing Refresh, by loading content instantly. Duplicate content is a serious risk, if the content such as an inventory feed is presented with infinite scrolling functionality; it eliminates duplicate content and keyword Meta data cannibalization. 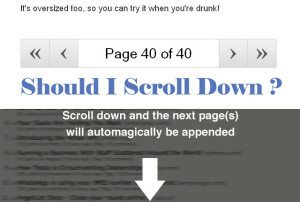 Infinite scrolling doesn’t confuse visitors by forcing them to jump around between different pages. So conclusion is Facebook, twitter like social networking sites or advertisement related networks can get benefits of this endless scrolling but less content websites or shopping websites can’t efficiently use this technique but infinite scrolling trend will continue. Your aim should be to do deeper study of this technique & to take benefits of using pagination or endless scrolling whenever required on your well designed website. ← Can you write Search Engine Friendly Blog Post?